Welcome to the first episode of the Zimbra Podcast! This episode features host Gayle Billat (@GayleBillat) – Worldwide Solutions Training Manager at Zimbra, a Synacor Company and I: Jorge de la Cruz (@JorgedlCruz) – Technical Marketing Manager at Zimbra. During this episode, Gayle and I talk about a mix of future topics we will cover in upcoming episodes and introduce ourselves as well. The new Zimbra Podcast channel — it’s an opportunity for you to tell us what do you want to hear in future episodes, or even participate. 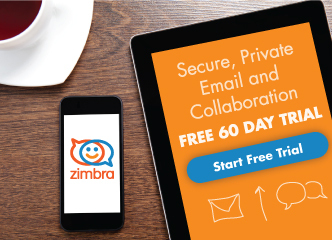 If you have an interesting topic regarding Zimbra and think we can cover it in 5 to 15 minutes, just send us an email to zimbra-team@zimbra.com or comment on this Blog Post. Will the legacy podcasts make it to the podbean location? Yes, it’s a good idea, you can find them still on this Blog, under the podcast category. We look forward to having you on future podcasts John! Great. I loved it. Looking forward to more of Zimbra Podcasts. Excellent work team! Looking forward to learning lots here!